We sat down with Kathy Peach former Chandler-Gilbert Community College (CGCC) student and successful children’s author for a brief Q&A to chat about her recent visit to CGCC’s Children’s Literature class, her new children’s book The Tiniest Tumbleweed and the inspiration behind her pages. 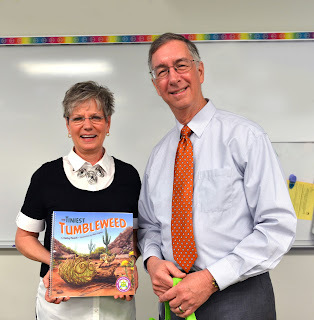 Connections (CX): You recently visited Chandler-Gilbert Community College to talk about your first children’s book The Tiniest Tumbleweed. Tell us more about the event and what it meant for you as former student to come back and share your book with the CGCC community. Peach: The purpose of my visit to Chandler-Gilbert Community College (CGCC) was twofold. First, it was my desire to dedicate a copy of The Tiniest Tumbleweed to the CGCC library. It was my privilege and pleasure to meet and present a copy to CGCC interim president Dr. William Guerriero. CX: In addition to your book reading, event attendees were able to learn more about your relationship with CGCC. Can you explain your book’s connection to your time as a student at CGCC? Peach: During my visit to CGCC, I had the good fortune to spend time with the future teachers attending Professor Sharon Fagan’s Children’s Literature class. It was when I was attending professor Fagan’s Children’s Lit class that I learned of the components of literature that define a piece of children’s literature as quality. In writing The Tiniest Tumbleweed, I referred to the handout we were given in class where each component was explained. I literally compared my manuscript to the handout, over and over again to ensure I was incorporating as many of the concepts as was possible. CX: In addition to your book reading, event attendees had the opportunity to hear from your book’s publisher and author. Tell us more about their involvement. Peach: The students in attendance had the opportunity to meet the publisher of the book, Mrs. Linda Radke. Mrs. Radke is owner and president of Five Star Publications, Inc. a local and award winning publishing company located in Chandler. The Tiniest Tumbleweed is published through Little Five Start, the children’s division of Five Star Publications, Inc.
As an additional treat, Alex Lopez, the illustrator, joined the class via Skype. The students heard how Mr. Lopez envisioned and drew the artwork for the book. Mr. Lopez stated that he enjoyed the story and easily formed an emotional connection with the characters, the tumbleweed and sparrow parents wishing the best for their children, as his own triplet daughters, too, were small at birth. CX: What influence did CGCC have on your desire to become a children’s author? Peach: I moved to Chandler, AZ in March of 2009 and enrolled at CGCC as a first time college student in May of 2009. Three life changing events happened while I was in attendance. The first occurred in Sharon Fagan’s Children’s Literature class. I had always wanted to write a children’s book. Based on the information in Fagan’s class, the goal changed. No longer did I want to write a children’s book. I wanted to produce a piece of quality children’s literature. There is a difference. Time will tell whether or not I will have fulfilled my goal. Second, I was introduced to Dr. Albert Bandura’s work in the concepts of self-efficacy during Dr. Karen Hardin’s Psychology 101 class. The Tiniest Tumbleweed rests on the foundation of Dr. Bandura’s work. His work also served as the basis for the scientific research required to complete my thesis at Barrett, The Honors College at Arizona State University. Third, I received an invitation to apply to Barrett Honors College during my final semester at CGCC. The rest is history. When I enrolled at Chandler-Gilbert Community College, my oldest daughter, Tiffany, said, “Mom, the world is going to open up to you in ways you will have never thought possible. That’s what college does for people.” Little did I realize how prophetic her words would become and my “world opening up” experience all started at Chandler-Gilbert Community College. I am delighted to be able to give back a small portion of what the institution has given to me. The Tiniest Tumbleweed released on January 8, 2016 and is already in its second printing. It became an award winning book two times in March 2016 recognized as honor awardees at both the 2016 Southwest Book Festival contest and the Los Angeles Book Fest contest. Through Eileen Bailey and KidsReadUSA, a copy of the book was placed into the hands of every third grader in the Balsz School District. The Washington School District recently bought copies for their Special Education Department and their Head Start teachers. There have been several sold out author signings at Sibley’s West, The Chandler and Arizona Gift Shop located in downtown Chandler, AZ. You can purchase the book the Chandler-Gilbert Community College bookstore, Chandler, AZ and through www.tiniesttumbleweed.com, Amazon.com, and Barnes and Noble.com. I am also available for school visits. Please contact Little Five Star Publications at 480.940.8182 for details.